What’s up I’m Joey Walker! You can hear me on 93Q weekdays from 10 am – 3 pm. I’ve lived in Syracuse all my life and love it here! Growing up I always had a love for radio and always wanted to be on-air. I graduated from Liverpool High School in 2000 (same class as 93Q’s Rick Roberts) and I attended Onondaga Community College for Electronic Media Broadcasting. 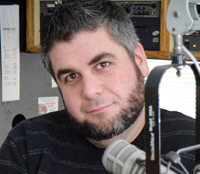 I’ve been on-air in Syracuse on many different radio stations since 2007…being on-air is a dream come true! When not on-air you can find me hanging out with my son Gavin, my daughter Olivia, and my wife Tiffany! I love playing the guitar, watching sports, playing poker and The Boston Red Sox! I look forward to hanging out with you every weekday!